Danny Frame was born in Shubenacadie. He was active in most sports as a youth and was Athlete of the Year when graduating from South Colchester High School. After SCHS he enrolled at Acadia University to study and to play football with the Axemen for five years. He helped them to the AUS title in 1998, was three times AUS All Star at Offensive tackle and Guard and was three times All Canadian. He was nominated for the James Bayer Award as Top Student Athlete in Atlantic Canada. 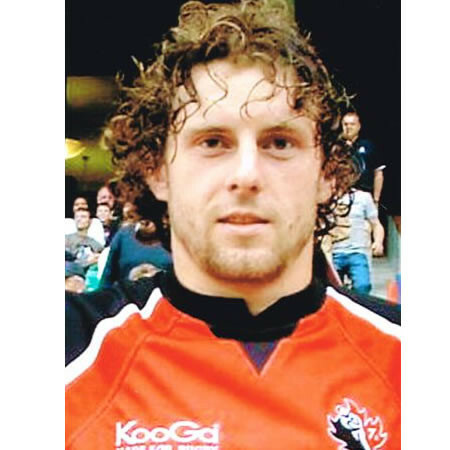 In 2003 he received an Acadia Citizenship Award for Community Service, Academics and Athletics. Danny had a workout with the NFL’s Arizona Cardinals in 2001. Following Acadia Danny had three successful seasons in the CFL with the Toronto Argonauts and Winnipeg Blue Bombers. His CFL highlight was Player of the Game Honours in October 2003 versus Montreal. In 2006 Danny began competing in Strongman and the following year in Highland Games Heavyweight Events, especially Throwing. In Strongman he won Atlantic Canada’s Strongest Man in 2007 and 08, placed sixth in Canada in 2007 and 7th in North America in 2008. In Highland Games Danny was Maritime Champion in 2009, and twice was top 3 in Canada; in Throwing he was top 10 in Canada every year from 2007 – 2016. He has represented Canada at three World Championships and eight North American. He holds numerous records especially for Caber and 56 pound weight over bar of 17 feet. Still competing respectfully in Highland Games the Sports Heritage Wall of Fame is honoured to welcome Danny Frame as a most worthy Athlete.